The modern media trick is to report a football match and cover all the angles in a scattergun of clickbait and ‘debate’. And so it is for the Sun’s reporting on Stoke City’s 1-0 win over Arsenal. The trouble begins when readers notice the corruption of facts. 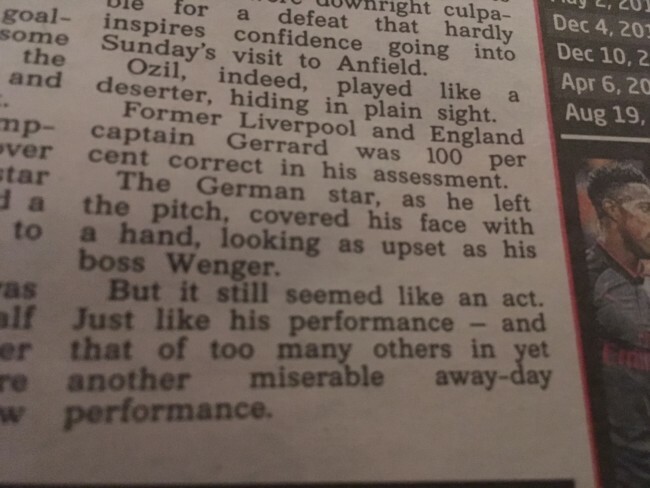 In one story, the paper slams Arsenal star Mesut Ozil’s “lifeless performance”. Another story on the game is punctuated with “Should Arsenal get rid of Ozil now?” Yet another story tells readers: “Ozil, indeed, played like a deserter, hiding in plain sight.” Steven Gerrard, the former Liverpool captain now working as TV pundit, was “100 per cent right” to call Ozil a “liability”, says the paper’s Ken Lawrence. 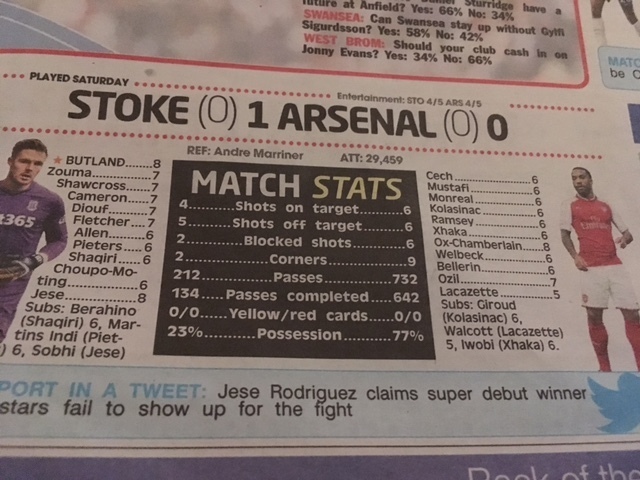 And that’s odd because in the Sun’s round-up of the match, Ozil scores a 7 out of 10, making him the Gunners’ second best performer after Alex Oxlade-Chamberlain (8) – and the joint fourth best player on the pitch after ‘The Ox’, Stoke’s Jack Butland (8 – the game’s Man of the Match) and Jese (8). Have the tabloids got it in for Ozil, or have they simply worked out that slamming him get Arsenal fans excited? Just last week, the Mirror labelled Ozil a “loser”, although all the facts pointed to him being anything but. It’s almost as if the stories write themselves to an agenda.